I decided to pull over and stay at a small motel on the Texas Louisiana State line......... to be honest I couldn't really go on ......... the Texas cop pulled me over...... thought I was drunk cos I was weaving a bit ......... he was right...... it was time to stop....... He was a nice bloke. I drove last night from Venice Louisiana to Houston Texas from darkness in New Orleans to the early hours in Houston. I did that OK........ But there was no way I was gonna do it in the other direction again tonight ........ From Blessing Texas to Grand Isle Louisiana......... 10.5 hours driving according to my Sat Nav....... No way........ So I am on the Texas Louisiana State line........ That leaves me a fair way to go tomorrow. 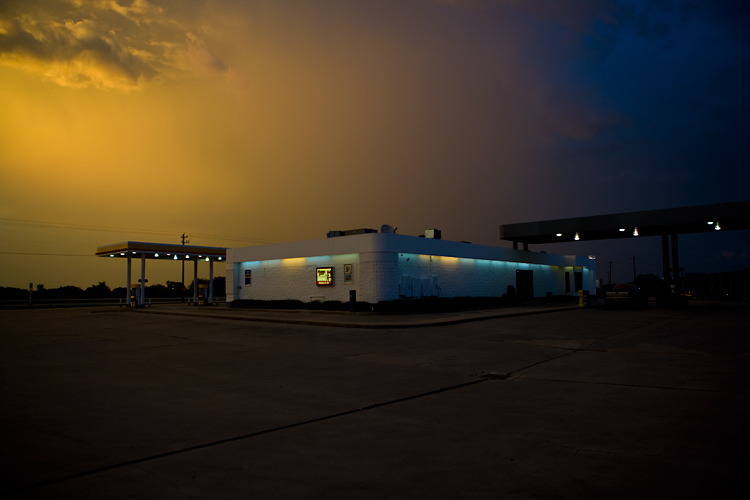 I shot this image on Highway 59 heading back to Houston from Blessing ........ 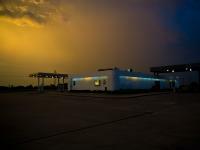 I should have been driving........ but I was just stopped at a Shell gas station ........ on the wide open space with the giant Texas sky overhead as light slipped away to darkness.